It is replaced by the Zebra 110XiIIIPlus. 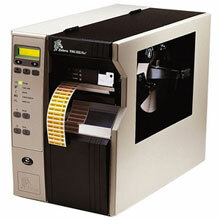 The 90XiIII Plus printer is ideal for applications requiring small, high-resolution barcode labels. The 90XiIII Plus printer is ideal for applications requiring small, high-resolution barcode labels including printed circuit boards labels, serial plate or product identification labels, and asset labels. The printer's 300 DPI resolution ensures text, graphics, and barcodes always print clearly - essential when label size is limited. The 90XiIII Plus is designed to deliver maximum performance and reliability in the most demanding industrial applications. The Zebra 90XiIII Plus features 16MB RAM, 4MB Flash, & standard parallel, serial, and USB 2.0 interface ports. All units ship with one user's manual. Thermal transfer, 300 dpi, 8 ips, 3.4" print width, parallel, serial & USB 2 interfaces, 16MB SDRAM. Includes rewinder, ZebraLink & US power cord. Order cables separately. See accessories. Thermal transfer, 300 dpi, 8 ips, 3.4" print width, parallel, serial & USB 2 interfaces, 16MB SDRAM. Includes cutter with catch tray, ZebraLink & US power cord. Order cables separately. See accessories. Thermal transfer, 300 dpi, 8 ips, 3.4" print width, parallel, serial & USB 2 interfaces, 16MB SDRAM. Includes ZebraLink & US power cord. Order cables separately. See accessories. 3" x 1" Thermal transfer polyester label. 5,240 labels/roll, single roll. Also available as a case (Part# 10011709).